Sorry it's been a while...hope everyone had a great holiday season. We enjoyed a family cruise for Christmas. That makes a great gift for everyone!! Enjoyed bringing in the new year...and am looking forward to another great year like last!! I have been blessed in so many ways! Today I want to share a sneak peek at a new stamp set coming from Sparkle N Sprinkle. We are now creating stamp sets using Beccy Muirs digital images and have 2 sets coming from her and then we will also be releasing 2 new sets from Michelle Perkett! 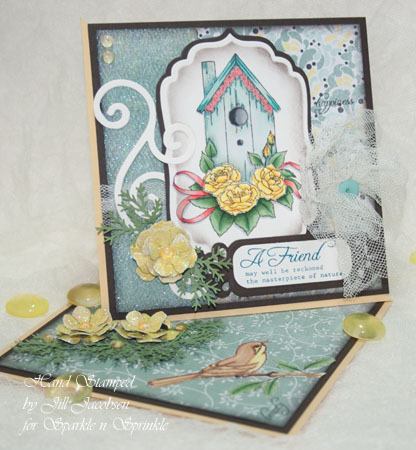 I just love this Birdhouse set! I stamped with Espresso Truffle and colored with Copics. The paper is Authentique Paper Renew line, such pretty soft colors. The left side was cut with a border punch and sparkled with Velvet Sparkle EP. The flowers we cut with the Rose Creations dies and glittered with Lemonade Glitter. 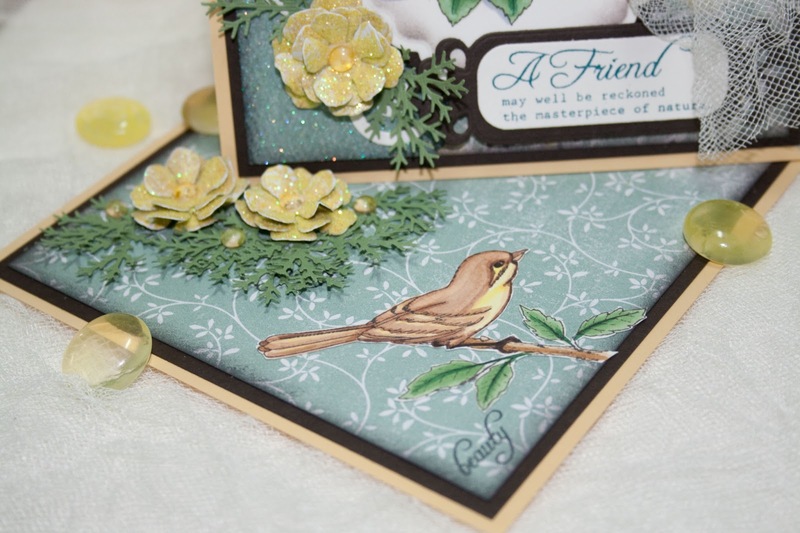 I had a hard time deciding what kind of card I wanted to make with the images and finally opted for the side easel. The roses on the front are actually stamped a second time and cut out and adhered with dimensional tape...but you can't tell that from my photo. Thanks for stopping by and I hope you have a blessed new year! 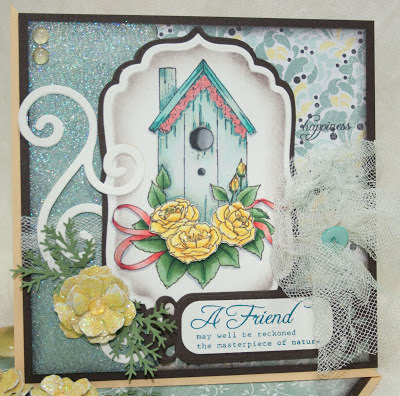 Jill, your twisted easel card looks marvelous - so frilly and pretty with the dimensional details. I love that color ink you used with the stamp. I love the twisted easel card. Looks so fab with the birdhouse image. Love it! This is beautiful! I love the colors and all the wonderful elements! Great! This is a masterpiece Jill! So much texture and dimension, and I love the side easel. Gorgeous! Loved everything about it. Stunning!! What more can I say. Love it.